Let this charming bridal ring set capture you from the first glance. Uniquely crafted with a standout design feature, the set showcases a beautiful Holy Spirit dove. Crafted in sterling silver, the dove shows off a brilliant white color that is accented by the 5mm white topaz gemstone. 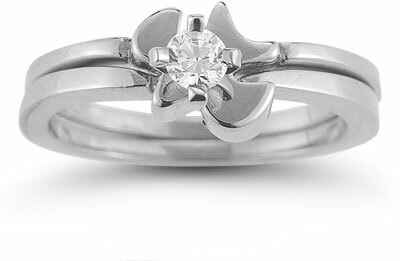 This round cut gem rests prettily in the dove, which is supported by the two sterling silver bands. The entire bridal ring set rings with truth and beauty, and makes the perfect emblem of marriage. *Item is available in size shown for 24 hour shipping. Item is eligible for resize at an additional charge and additional 5 day processing time. We guarantee our Holy Spirit Dove White Topaz Bridal Ring Set in Sterling Silver to be high quality, authentic jewelry, as described above.